I was already working on one blog post about medical woo, then this arrived in the mail yesterday. I am no photographer, but hopefully you can read what it says on the package. 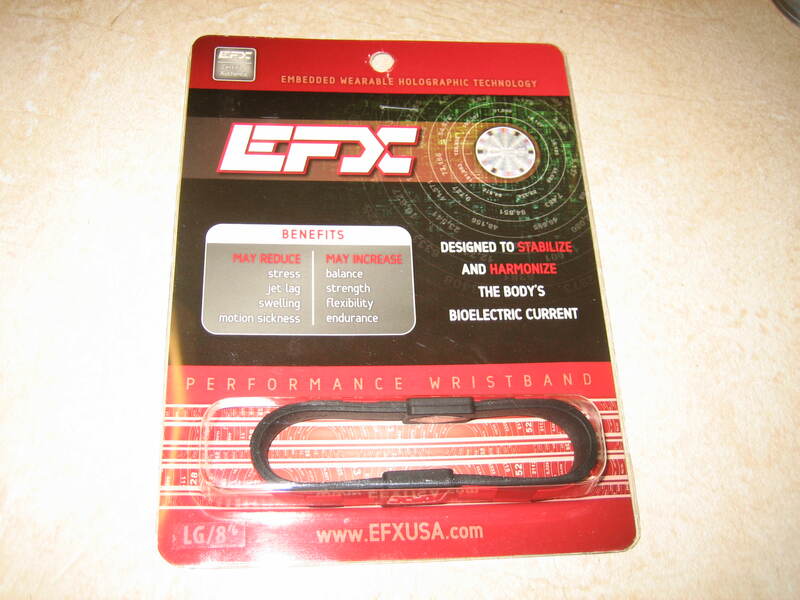 According to said packaging, this is an EFX Certified (ooh, certified) Authentic Embedded Wearable Holographic Technology Performance Wristband. Well ain’t that special. I’ll do a breakdown of all the interesting tidbits on this package. (physiology) A self-propagating electric current generated on the surface of nerve and muscle cells by potential differences across excitable cell membranes. No mention of why I might need to stabilize or harmonize it though. Anyway, it says the benefits may reduce stress, jet lag, swelling and motion sickness, and may increase balance, strength, flexibility and endurance. Wow, sounds great. Dare I say too great? The thing is basically a silicone (like lots of cooking utensils use) wristband with a cheesy little hologram picture in it. You know, like credit cards have been using for decades, several companies use on their currency, and passports have. It’s useful because they are pretty hard to forge. Which however has absolutely nothing to do with your “Bioelectric Current”. Turns out it’s another scam. These bracelets do nothing to improve your balance or otherwise. Wikipedia has a pretty good breakdown of an experiment done with the similar Power Balance wristband. At least there is some justice in the world. A lawsuit in Australia against Power Balance forced them to retract all their claims. I should add in closing that this thing arrived in the mail, addressed to a previous occupant of our house. It kinda looks cool, and I like silicone, but there’s nothing magical about it. Just a piece of rubber. Oh, and please don’t go shell out up to $60 for one, with the expectation that it will help you in some way. Get a wristband that donates the money to some charity, instead of scammers looking to make an easy buck off a few cents worth of silicone.